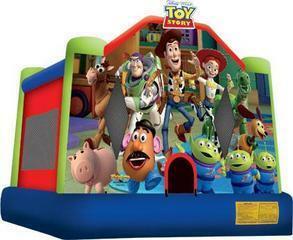 This interactive bouncy house features the Toy Story characters, from Buzz and Woody to Rex and Hamm. Participants will enjoy jumping, sliding, and exploring their own Toy Story 3 playroom! This bounce house combo offers up four different activities for endless hours of play. This bouncy castle has a large interior jumping area and a basketball hoop for group interaction.